Green Curry is the most popular of all Thai dishes, and this Thai Green Curry Chicken recipe is simple to make, yet tastes like it came from your favorite Thai restaurant. Unlike most green curry recipes, this one doesn't call for packaged curry paste - instead, everything is made fresh, resulting in the best possible taste and greatest health benefits. 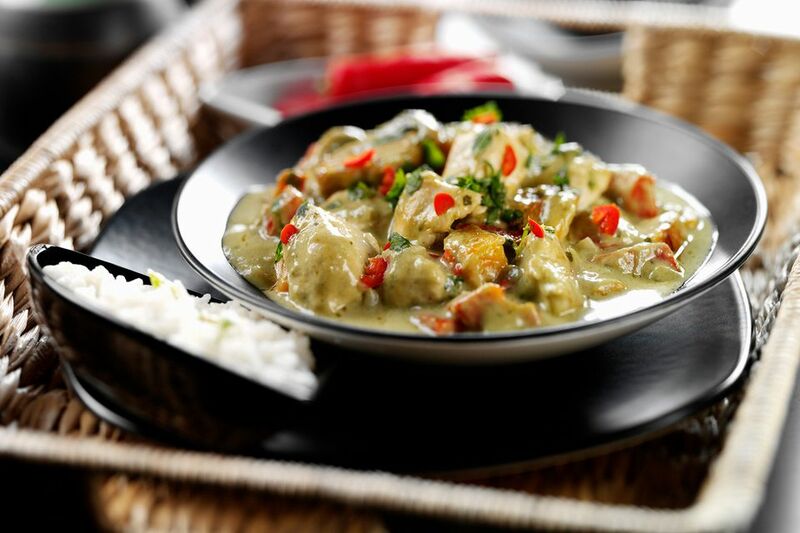 Just follow these easy directions to a great Thai green curry you'll want to make again and again! Place all the "green curry paste" ingredients together in a food processor, and process to a paste. If needed, add a few tbsp. of coconut milk (lower liquid part of the can) to help blend ingredients. Set aside. Warm a wok or large frying pan over medium-high heat. Add the oil and swirl around, then add the green curry paste. Stir-fry briefly to release the fragrance (1 minute), then add 3/4 of the coconut milk, reserving roughly 1/4 for later. Add the chicken, stirring to incorporate. When the curry sauce comes to a boil, reduce heat to medium or medium-low, until you get a nice simmer. Cover and allow to simmer 5 to 8 minutes, or until chicken is cooked through. Stir occasionally. Add the zucchini and tomatoes, plus the strips of the lime leaf (or lime zest), stirring well to incorporate. Simmer another 4 to 6 minutes, or until vegetables are softened but still formed and colorful. Do a taste-test for salt, adding 1 to 2 tbsp. fish sauce if not salty enough. If you prefer a sweeter curry, add a little more sugar. If too salty or sweet for your taste, add a squeeze of lime or lemon juice. If too spicy, add more coconut milk. Note that this curry should be a balance of salty, spicy, sweet and sour, plus bitter. Serve in bowls with rice on the side, allowing guests to add their own. Top each portion with a drizzle of 2 to 3 tbsp. reserved coconut milk, plus a sprinkling of fresh basil. Additional chopped red or green chili can be added for those who like it spicy.